The H&M Conscious exclusive collection is where fashion and sustainability collide. The collection features an array of dynamic staples and statement pieces all consciously made with sustainable materials like organic silk and recycled glass. Many of you may not know it, but I am LEED Certified! As someone with a passion for both fashion sustainability, H&M’s Conscious collection means a lot. 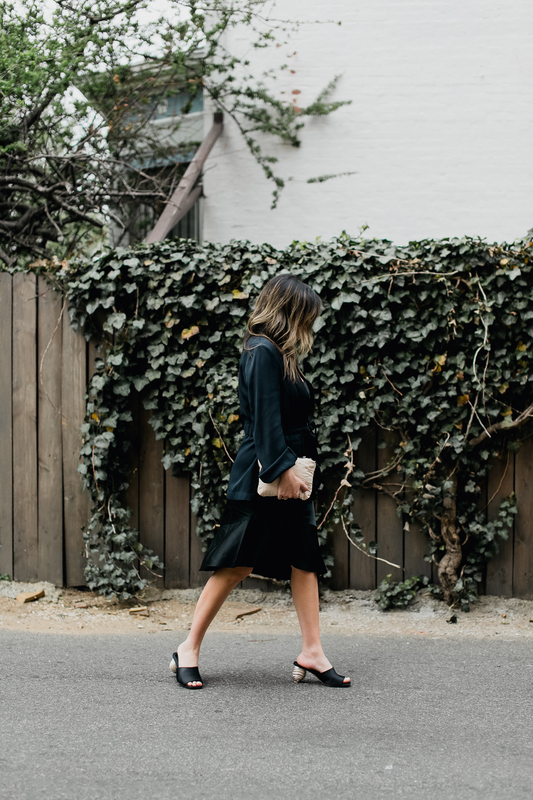 Before becoming a full-time blogger and creative consultant, much of my work in the corporate field revolved around sustainability, and it is a wonderful thing to be able to incorporate sustainability into my wardrobe. For this look, I wanted to keep things classic, sharp, and neutral! This flowy, organic, silk satin dress was a perfect addition to my second trimester wardrobe; the gentle silhouette and seriously comfortable cut are perfect for my growing bump. I paired the dress with a classic blazer, a simple purse, and a pair of statement mules. Special thanks to H&M for sponsoring this post. These shoes are just so cool! I love your chic all black look! That outfit is so chic! love the all black look! Those heels are so much fun! I love the conscious collection too! i love love love thissss! I love H&M but because they aren’t socially conscious it always gave me pause – so hearing this news makes me SO happy. Thank you thank you! You look so chic! Love the collection. Those shoes are cool! What a stunning look! I adore the H&M Conscious Collection. The pieces are always so beautiful! I love how chic this collection is! You look stunning! 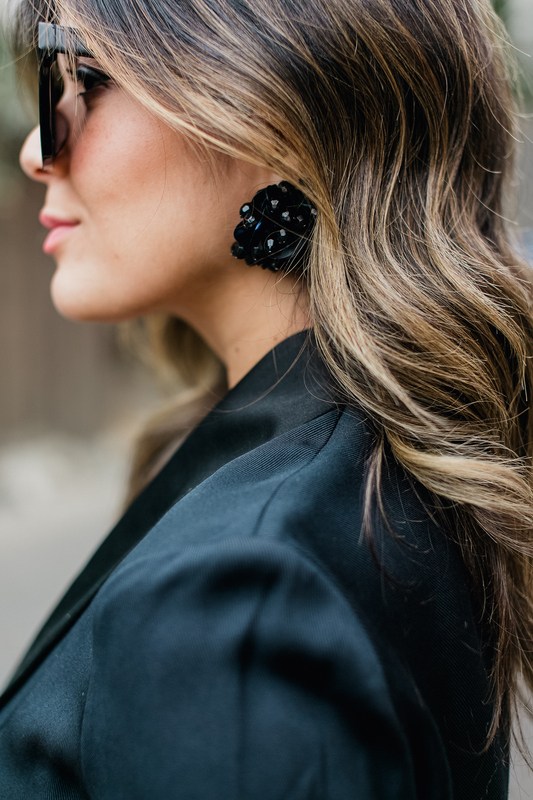 I love those earrings! OMG! I loveeee H&M, I need to check this collection out!!! I love that they finally are taking note about the environment! Love this look. Those shoes are so cool! Love. Beautiful outfit! I especially love the shoes <3 It's so nice to see more sophisticated pieces from H&M as opposed to the slightly Forever-21 pieces they keep bringing out!